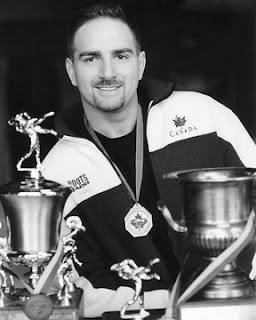 The way he was: Mike Roselli wins a national wrestling title for Douglas College in 1991. Few people can say they’ve wrestled with Bret “The Hitman” Hart, dined with Hugh Jackman and had their wedding flowers bought by Halle Berry. But Mike Roselli can. The former professional wrestler, Hollywood actor and stuntman spent 18 years in the Worldwide Wrestling Federation/World Wrestling Entertainment and in film before retiring and returning as a student to Douglas College. A student in the Sport Science program from 1989-91, Mike was also on the College wrestling team, and earned a national title for Douglas in his final year. It was at this competition that someone from the WWF saw him and offered him a job. He didn’t think twice about packing his bags. Known throughout his nine year-career as the Olympian, Olympian Mike Powers and Iron Mike, Roselli wrestled with the likes of Hart, Jimmy “Superfly” Snuka, Rowdy Roddy Piper and knew all the biggies, including Hulk Hogan. Though Mike loved being an actor, the stunt work proved to be “phenomenally dangerous.” In 2007 he broke both feet and blew one knee after his safety wire snapped while he was jumping off a three-storey balcony. His doctor told him it would be two years before he could do any stunts again. Mike graduates in 2012 and plans to become a teacher. He says he’s happy with his decision to come back to Douglas – the place where it all began – to finish what he started. “When I started at Douglas 20 years ago, I didn’t know – like every other kid – what I was going to do. So I came here and I got a little education and I got a sport that led to two careers within the last 18 years, which have been phenomenal to me. And when I was lost again, I came straight back to Douglas. Now Douglas has set me on my path for yet another career.